Today, Prince Law Offices Prepares for Community Meal with Almost 300 Pounds of Beef! Posted on December 9, 2011 December 9, 2011 by Joshua Prince, Esq. Today, Prince Law Offices, P.C. 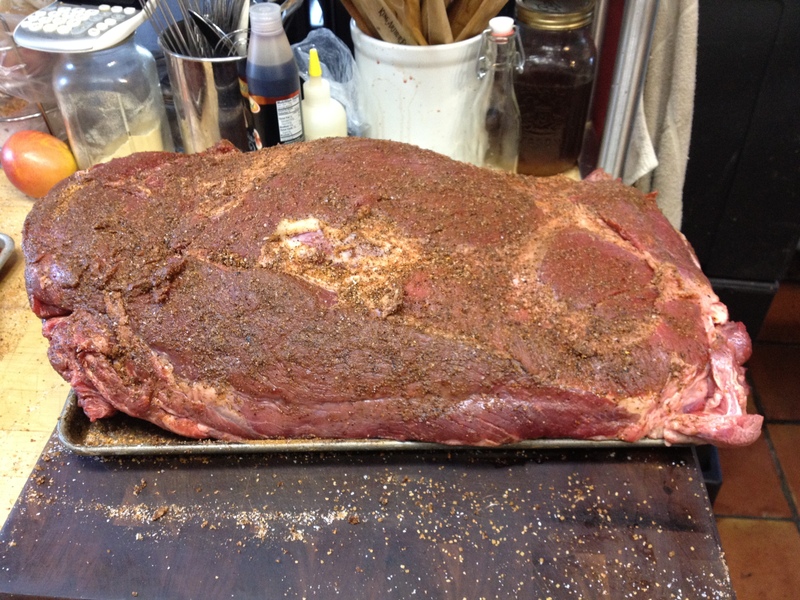 (PLO), prepares for our 3rd annual Community Meal with almost 300 pounds of beef, as pictured below. The PLO Community Meal will be held tomorrow, Saturday, December 10th, 2011, between noon and 5PM, behind our Reading office, located at 42 South 5th St. (food is available on Wood St., which runs parallel to S. 5th St.). For the past three years, PLO has reached out to the Reading community and whoever else wants to attend, by providing a hot, homemade meal, with all the side-dishes and fixings. We call this the PLO Community Meal. There is no preaching, no sermons to be read, only good hot food that is prepared by all the staff at Prince Law Offices. Started in 2009 by the President of the firm, Warren Prince, due to his love of cooking and desire to help the local community, the PLO Community Meal has grown to become an event that many in the Reading community anxiously await. With eight Chuck Roasts, each weighing in around 35 pounds a piece, which are slow cooked overnight on the premise after being rubbed with a special blend of herbs and spices, it is no wonder that the word has spread. While the chuck roasts are the main course, PLO, especially with head cook Warren Prince at the helm, couldn’t stop there. Thanks to all the staff at PLO, attendees will find everything from homemade macaroni and cheese to pumpkin pies to apple cider. If you want a hot, homemade meal or know someone who needs a hot, homemade meal with all the fixings, send them over to the PLO Community Meal. Also, if you ever wanted to meet the staff or attorneys of PLO, stop on over because we’ll all be there. Staff: Cindy Bernhard, Dana Gantert, Bea Knarr, Rose Johnson, Louise Moyer, Janice Prince, Angela Scheetz, and Tammy Taylor. Attorneys: Thomas Beveridge, Esq., John Fielding, Esq., Alexandra French, Esq., Matthew Hovey, Esq., Joshua Prince, Esq., Warren Prince, Esq., and Karl Voigt, Esq. Previous Post Can You Get Workers’ Compensation for a Back Problem That’s Related to Your Type of Work? Next Post PLO Community Meal Cook-Off Starts! Pingback: PLO Community Meal Cook-Off Starts! « Prince Law Offices, P.C.